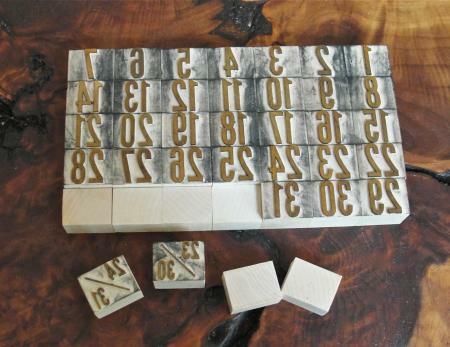 I just released a new wood type perpetual calendar font on virginwoodtype.com. The type is a simple narrow gothic and all of the numbers and spaces are centered on the same size blocks to make it easier to change the numbers for each month. I am going to work on patterns for matching week names and month names. Since I haven’t made the patterns yet, I am looking for suggestions for those elements. What is the relevance of the 23/30 & 24/31? They are split days. 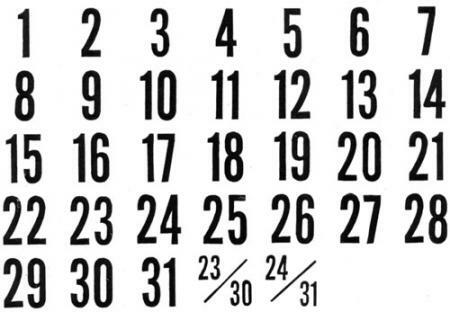 Used when the last days of the month run longer than the number of rows. I enjoy printing a calendar for my own private use, most years, and I might suggest that you cut 7-blanks, since months, like Feb. 2019, which started on Friday, and have 28-days, will require 7-blanks. Another suggestion is that you cut moon-phases, and possibly holiday inserts. The days-of-the-week should match the face of the figures and just have 3-letter abbreviations; SUN MON TUE WED THU FRI SAT, and be half the size of the day-blocks. Months & years could be any size and face that will fit.